Following in the footsteps of Musical Encore in 2017 when GADOC celebrated its 90th anniversary, The Greatest Shows will feature a range of musical magic from many productions not yet staged by the Club. Wicked, Matilda, Hamilton, School of Rock, Dreamgirls and Mamma Mia are just a few of the treats in store as we take you on a musical journey through ‘The Greatest Shows’. Tickets priced £20 and £16 (Under 18s/OAPs) are available at all usual ticket venues, by telephone on 747280 or on-line at www.guernseytickets.gg. 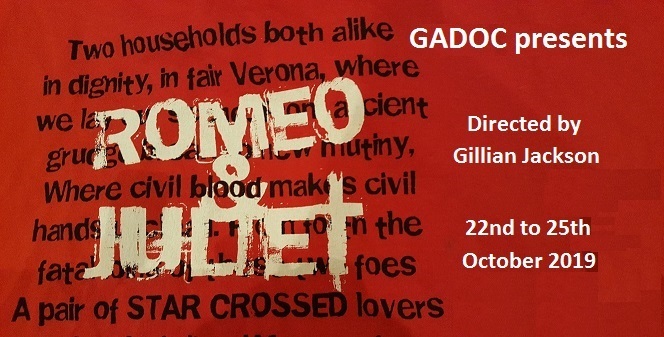 GADOC’s Annual One Act Play Festival 2019 will be held during the week commencing Sunday 30th June; the first part of the week will be devoted to Dress Rehearsals and the Festival itself will run from the Wednesday or Thursday, depending upon the number of entries received, ending on Saturday 6th July. Our adjudicator for 2019 is Richard Woodward who is a member of the Guild of Drama Adjudicators. There are a number of Trophies to be won at the Festival with special classes for juniors under the age of 15 and under the age of 21. Full details of the Festival, including Rules of Competition and Entry Forms, can be obtained from the secretary of GADOC, Katey Cheshire, or from Barbara Minta, co-ordinator of the Festival. Dates for your diary (subject to confirmation) – Audition packs available on 1st June from St Peter’s Post Office. Auditions on 14th July at the Rink (probably 2pm). Keep checking here or on Facebook for any updates.